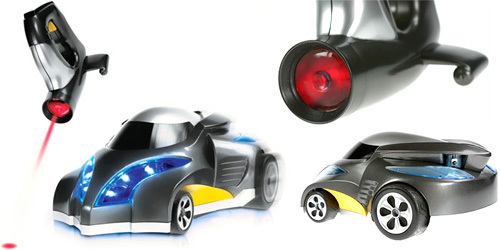 Infrared Tracker RC Car | OhGizmo! By Andrew Liszewski on 09/23/08 • Leave a comment! Have you ever watched a friend drive their dog or cat crazy with a laser pointer and wished you could do the same? But you know, without all the responsibility and other downsides of owning a real pet? Enter the Infrared Tracker Remote Control Car which should pretty much provide the same level of entertainment, but without ever soiling the living room carpet. The remote produces a visible infrared dot that you project on the floor, and once the vehicle ‘senses’ this dot (from as far as 5 feet away) it will give chase until it runs out of battery life. A 7.2V rechargeable battery gives it about 20 minutes of runtime, which is probably about twice the amount of time it will take you to get bored of playing with it. You can pick one up from RichardSolo.com for $49.95.